Cigarette smoke contains over 7,000 chemicals, 69 of which are known to cause cancer. Smoking is responsible for 90% of lung cancer deaths and 80-90% of deaths from chronic obstructive pulmonary disease (COPD) (e.g., emphysema, chronic bronchitis). In fact, approximately 443,000 deaths are attributed to cigarette smoking each year. The good news is that smoking cessation has immediate health benefits. Within 20 minutes, your blood pressure will be lower; within 12 hours, your blood oxygen levels will have increased to normal; within 48 hours, your sense of smell and taste will begin to return; within 72 hours, your entire body will test 100% nicotine-free and over 90% of all nicotine metabolites will have been eliminated by your body; and within two weeks to three months, your heart attack risk will have dropped and your lung function will have improved. The financial benefits of smoking cessation are large and tangible. At $5-$14 per pack, stopping smoking can save you several thousand dollars per year. 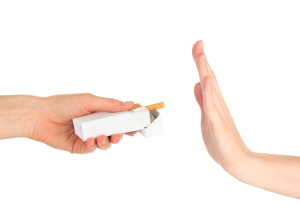 Call (301) 365-2428 for a free consultation to discuss becoming a non-smoker. US Department of Health and Human Services. How Tobacco Smoke Causes Disease: The Biology and Behavioral Basis for Smoking-Attributable Disease: A Report of the Surgeon General, 2010. Centers for Disease Control and Prevention. “Smoking-Attributable Mortality, Years of Potential Life Lost, and Productivity Losses – United States, 2000-2004.” Morbidity and Mortality Weekly Report, November 14, 2008; 57(45):1226-1298.